One of the book treasures on my shelf is an old volume of the fairy tales of Hans Christian Andersen. It is another well-loved book, worn and fraying at the corners of the cloth cover. I read those stories over and over again as I was growing up. And I have a vague and very nostalgic recollection of an old movie musical about him, starring my favorite, Danny Kaye. Today is Andersen’s birthday, which is also celebrated around the world as “International Children’s Book Day.” He was born in Denmark 203 years ago. 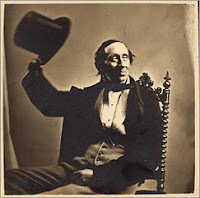 I celebrated by reading Jane Yolen’s lovely little biography of him, The Perfect Wizard: Hans Christian Andersen, and also by rereading my favorite fairy tales from that most treasured book. So which tales were my favorites from that old volume? I loved The Tinder Box, The Steadfast Tin Soldier, The Little Match Girl, and The Nightingale. 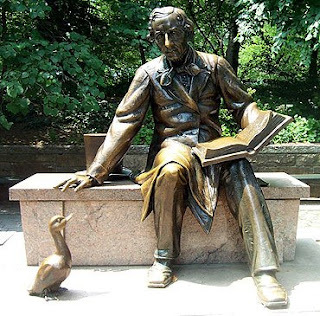 It seems very fitting, while I’m enjoying reading so many different stories and tales for Carl V’s Once Upon a Time 2 reading challenge, that I celebrate and read about one of the beloved masters of storytelling: Hans Christian Andersen! This entry was posted in Challenges, Children's books, Non-fiction on April 2, 2008 by Robin. I didn’t know about the Jane Yolen biography! It sounds lovely indeed. I remember the first time I read The Little Match Girl well. I was 10, and I cried for an hour. His stories are so sad…and I think that’s one of the reasons why they caused such a great impression on me. The Snow Queen is a favourite of mine. Nymeth, I haven’t read enough Jane Yolen! I just picked up the audiobook of Briar Rose at the library and can’t stop listening! And I read your review of The Young Merlin Trilogy and will definitely have to read that one, too. I have a HCA volume with art by Lisbeth Zwerger that is just beautiful. I need to get around to reading it sometime! Carl, I love Lisbeth Zwerger’s illustrations, so I’m sure I’d love that book. I’ll have to look for it. Great post! I enjoy reading about older authors to be reminded of classics still worth reading.